If temperature sensors and safety devices such as TPRs malfunction, water in the system may become superheated (exceed the boiling point). Once the tank ruptures and water is exposed to the atmosphere it will expand into steam almost instantly and occupy approximately 1,600 times its original volume. This process can propel a heating tank like a rocket through multiple floors, causing personal injury and extensive property damage. Water-heating appliance explosions are rare due to the fact that they require a simultaneous combination of unusual conditions and failure of redundant safety components. These conditions only result from extreme negligence and the use of outdated or malfunctioning equipment. The TPR valve will activate if either water temperature (measured in degrees Fahrenheit) or pressure (measured in pounds per square inch (PSI)) exceed safe levels. 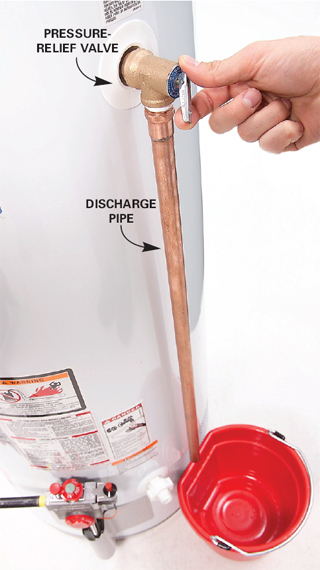 The valve should be connected to a discharge pipe (also called a drain line) that runs down the length of the water heater tank. This pipe is responsible for routing hot water released from the TPR to a proper discharge location. steel. PVC and other non-approved plastics should not be used since they can easily melt. Not be smaller than the diameter of the outlet of the valve it serves (usually no smaller than 3/4″). Not reduce in size from the valve to the air gap (point of discharge). Be as short and as straight as possible so as to avoid undue stress on the valve. Be installed so as to drain by flow of gravity. Not be trapped since standing water may become contaminated and backflow into the potable water. Discharge to a floor drain, to an indirect waste receptor, or to the outdoors. Not be directly connected to the drainage system to prevent backflow of potentially contaminating the potable water. Discharge through a visible air gap in the same room as the water-heating appliance. Be first piped to an indirect waste receptor such as a bucket through an air gap located in a heated area when discharging to the outdoors in areas subject to freezing, since freezing water could block the pipe. Not terminate more than 6 inches (152 mm) above the floor or waste receptor. Discharge in a manner that could not cause scalding. Discharge in a manner that could not cause structural or property damage. Discharge to a termination point that is readily observable by occupants because discharge indicates that something is wrong and to prevent unobserved termination capping. Be piped independent of other equipment drains, water heater pans, or relief valve discharge piping to the point of discharge. Not have a threaded connection at the end of the pipe so as to avoid capping. A properly functioning TPR valve will eject a powerful jet of hot water from the discharge pipe when fully activated, not a gentle leak. A leaky TPR valve is an indication that it needs to be replaced. In the rare case that the TPR valve does activate, the homeowner should immediately shut off the water and contact a qualified plumber for assistance and repair. Inspectors should recommend that homeowners test TPR valves monthly, although inspectors should never do this themselves because they may be held liable for any damage that might occur if the valve fails. The inspector should demonstrate to the homeowner how the main water supply can be shut off and explain that it can be located at the home main water supply valve or at the water supply shut-off for the appliance on which the TPR is mounted. The pressure at which a TPR valve will activate is printed on a data plate located beneath the test lever. This amount should not exceed the working pressure limit marked on the data plate of the water-heating appliance it serves. The BTU/HR rating marked on the water-heating appliance data plate should not exceed that of the TPR, which is marked on the TPR data plate. TPR valves with missing data plates should be replaced. Although a TPR valve might never become activated, it is an essential safety component on boilers and domestic water heaters. Guidelines concerning these valves and their discharge pipes reflect real hazards that every homeowner and home inspector should take seriously. As your Peterborough home inspector, I always inspect the TPR valve on the hot water heater tank. The valve is not tested, because valves that have not been operated regularly have a strong tendency to leak. However, I ensure that it conforms to inspection and safety standards.